Does NC State owe Dave Doeren an extension? RALEIGH, North Carolina (WTVD) -- Fresh off a thrilling win over Louisville, Dave Doeren has a good thing going with the Wolfpack this year: 5-1 and ranked in the Top 25 for the first time in his tenure. Tuesday morning, word first leaked that NC State and Doeren were working on a contract extension. Tuesday afternoon, I received this statement from Athletic Director Debbie Yow: "We're glad to be in negotiations. We want Dave here a long time and appreciate the progress that has been made." Yow is obviously confident that she has her man, and she might very well be right. 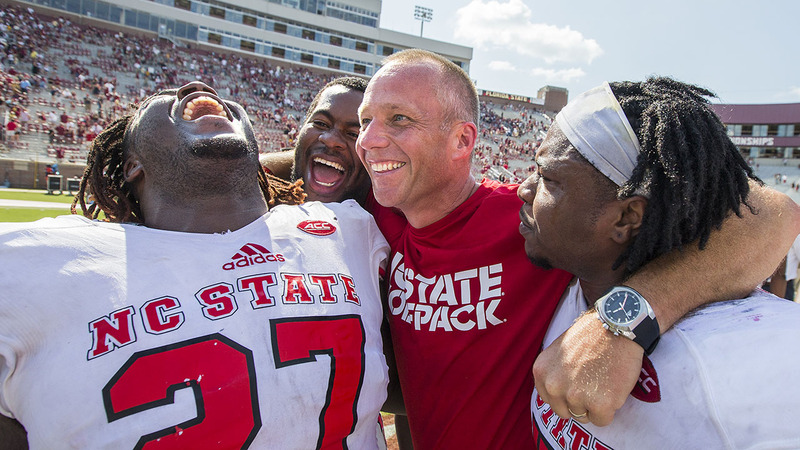 Doeren is clearly genuine in his affection for his players and they seem to feel the same way. He has built roster depth that wasn't previously in place and recruiting for the future, led by 2018 QB commit Devin Leary, seems to be coming along relatively swimmingly. With Doeren's current contract set to expire in 2019 and major vacancies almost certain at spots like Nebraska and Tennessee, it seems only prudent to make sure he's locked down at State. There's just a couple nagging questions -- why do this so early and why so sure that he's the man? Just five games ago, following the loss to South Carolina, it seemed we were very much in 'here we go again' territory and until this season, Doeren has really done nothing to warrant a new deal. The reason his current contract is only for two more years is because he hasn't managed to win eight games in a season yet since it was signed. Doeren's current deal is set up for him to be set up for constant employment and constant raises with only moderate success. Win eight games or more and more money and contract years are an automatic. This is a special senior class at State, with the likes of Bradley Chubb and Jaylen Samuels to name just two. They have been building to this season and so far, look to be capitalizing on that promise. What happens when they leave? Has Doeren done enough to inspire belief that the program will maintain the forward momentum built by this class? NC State's Nick McCloud (21) and Stephen Louis (12) congratulate Germaine Pratt (3) following Pratt's interception return for a touchdown to seal the win against Louisville. That's before we even consider that this season is only halfway done. An ugly loss doesn't seem likely, but Doeren's teams haven't been immune. There's no tangible reason to believe things will go sideways, but it's certainly a possibility. Besides, and this isn't even specific to DD, if the slightest uptick in winning means your old contract is moot, then what was the old contract for? Nobody gets paid to lose, but everyone seems to get raises when they win, even a little bit. I thought that was the point. And yes, I know, it's the market that dictates these deals. I just don't understand why Doeren would yet be a high-profile candidate for any high-profile vacancies. There's so much to like about Doeren. There's no hint of ego, beyond competitive fire. He desperately wants his teams to succeed for its own benefit, not his. The Pack has shown us something this year with wins over FSU and Louisville, but I need Doeren to show me something a little more before I'm convinced he's the guy that'll smash State through the ceiling that currently separates the Wolfpack from the elite in the Atlantic.